At the end of Drum Point in Solomons, several pilings remain, sticking up out of the water just feet from the shore. This is where the Drum Point lighthouse stood for 92 years. 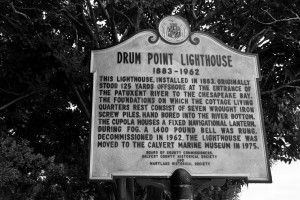 Moved to the inlet at the Calvert Marine Museum in 1975, it’s been restored to it’s former glory, in part, by the help of the late Anna Weems Ewalt whose grandfather, James, was the lighthouse keeper there. She was born in the Drum Point lighthouse, lived there for a time, and her own diary remains in one of the rooms, decorated as she remembered it. Children like that. It’s fun for kids to climb the steep ladder and explore the tiny rooms especially knowing that a little girl had lived there once. Family friendly and free with your Calvert Marine Museum admission, you don’t need more than 20 minutes to tour the small building, but it’s worth a stop if you haven’t seen it yet. I’d been looking for a traditionally tall lighthouse, but is perfectly hidden behind the museum buildings. The squat shape, called a screwpile, used to be common around here with 45 once sprinkled around the Chesapeake Bay. Now only three remain including Solomons’ Drum Point. On the National Register of Historic Places, its logbooks reside in the National Archives. History buffs will appreciate the uniqueness of this historical building while photographers will enjoy it’s beauty reflected in the water there. Unfortunately, the Drum Point Lighthouse is not wheelchair friendly. In order to explore the inside, you have to be able to climb a set of very steep stairs (Ladies, skirts are not advisable). Parents will need to keep an eye on younger children as well, but volunteers are on hand to help out. 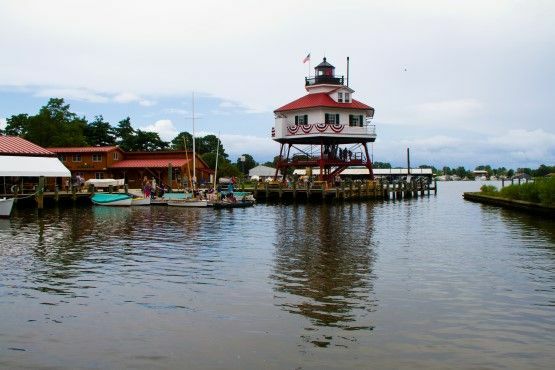 Read more about the amazing history on the museum’s website, or just head over there for a visit, explore the inside, and then sit back, relax, and enjoy the beautiful reflection in the water as you look at one of the prettiest views in Solomons.